Adding an elected Independent Auditor in Eugene is supported by a wide margin. However, it does not hit the crucial 70% level. Ideas that sound good tend to get a large amount of initial support. Campaigns tend to reduce that support. Usually a measure like this would need something above 60% to be really ahead and would like north of 70% to be comfortable. It’s important to keep in mind that this is based on the old wording and for a general election. Should have updated polling later in the year. 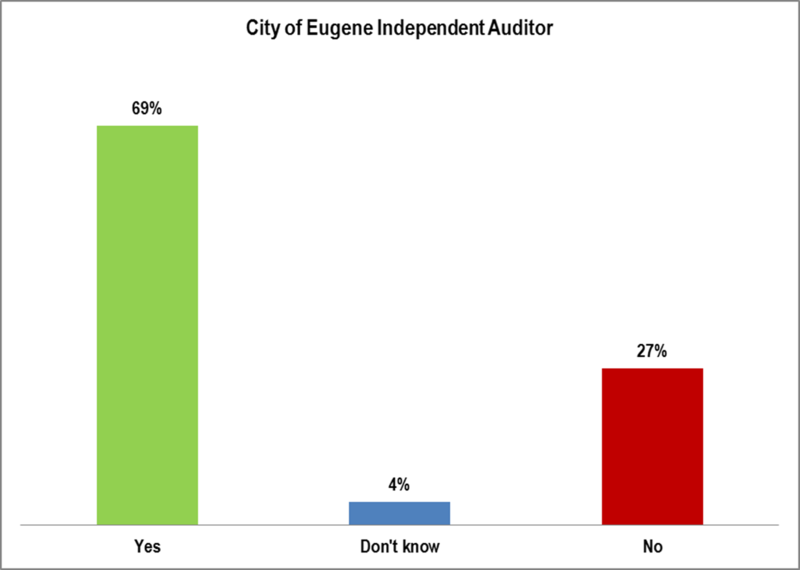 QUESTION: City of Eugene Office of the Independent Auditor. The auditor would be elected to four-year terms, would operate separately from the city council and manager and would conduct financial, performance and other audits of all city operations and activities. METHODOLOGY: 200 live telephone interviews of City of Eugene likely General Election voters were conducted April 10-11, 2017. The margin of error at the sample median is 7%. NOTE: The text of the question was based on official documents and coverage by the Register Guard newspaper at the time of the survey. Subsequently the city proposed a caption and question which would lead to a different survey question wording.